Laugh in the face of stress! Live a happy life! If you, or a loved one, is suffering from stress you must read this book. It's simple, it's easy and it's fun. The verses, quotes and insights within are from an eclectic and esteemed group, including Lord Byron, Andrew Carnegie, Charles Darwin, Emerson, JFK, Abraham Lincoln, Plato, Will Rogers and Dostoevsky, who serve to gently remind you that laughter is now, as it always has been, the very best of medicines. 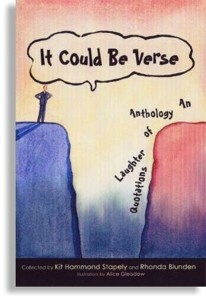 It Could Be Verse is a wonderful delivery of this medicine, providing the reader with insights into how laughter can heal. Collected by Kit Hammond Stapely, a Louise Hay Teacher (Louise Hay's book How You Can Heal Your Life has sold over 30 million copies) and a laughter facilitator, in partnership Rhonda Blunden, It Could Be Verse, will provide you with the ammunition to blast the destructive power of stress and the pressure of stressful situations out of your life. The Cancer Lifeline Kit is a comprehensive self-help Kit designed to be of great benefit and immediate help if you are affected or diagnosed with cancer. It has been developed to fill the large support and self-help gap experienced by many cancer patients and their carer's. This Kit is an interactive resource, helping you to combine the best of both worlds of conventional medicine with alternative and complementary medicine. It brings up-to-the-minute research, information and the most effective self-help tools available. The main components of the Kit are Part 1: The Cancer Lifeline Programme which helps people through the shock and trauma of their initial diagnosis, through making informed treatment choices, enabling them to prepare well for treatment physically and psychologically and to convalesce properly. Part 2: The Health Creation Programme, is designed to speed recovery by pro-active holistic health promotion and is also relevant to those with other chronic or lifestyle related illness. How Does the Health Creation Mentor Service Work? This is a telephone support service which can be accessed at any time from anywhere in the world. Kit will be your own personal Mentor and will provide ongoing individualised support for a cost of £45 per hour. Kit is a warm, caring and supportive companion and coach, who is trained to walk the journey to positive health with her clients. A Health Creation Mentor supports those seeking to promote positive health through Health Creation Proactive which is based on the Health Creation Programme, people with cancer using any part of the Cancer Lifeline Kit, or carers of people with cancer using the Carer's Guide. Please check out the Health Creation Page on this website for more details. If you would like Kit to be your Health Creation Mentor and support you in your journey you may purchase her services here. If you would like more than an hour change the number in the Quantity Box at the Checkout.